There are two main reasons to have the right dive boots when you go diving. The first, of course, is to make certain that your feet are kept warm enough both in tropical and colder waters. The other reason is to make sure that your ankles and feet are well protected from equipment, coral, and other rough surfaces. In this article, I will be looking into all of the features and details that you will need to understand when choosing the best dive boots. I will also be offering my own opinion on the dive boots that I consider to be the most useful for numerous diving conditions. What Type of Dive Boots Do You Need? What Is The Best Dive Boot? In most instances, the cut of the boot that you will require will depend on the temperature of the water that you are diving in. if you are diving in warmer waters, a low cut boot will be more than adequate. However, if you need greater insulation, a high cut will provide you with this. Now, high cut boots also tend to offer you more fortification. So, if you are diving in an area with lots of coral or if you are carrying more equipment, you may find that the high cut boot protects your ankles better. If you are diving from a boat or where there aren’t too many obstacles, then a low cut dive boot is all you need. You should keep in mind that the style of the dive boot will also be determined by your own preference. While some people may feel that high cut boots are comfortable, others could find that they create friction around the ankles resulting in chafing. When concluding whether you should choose a soft sole or hard sole boots, there are a few factors to think about. Perhaps the most important is the location that you will be diving in. If you will be diving near the shore, then you will probably have to worry about sharp rocks or hot sand. In this case, a hard sole boot will be most beneficial to you. 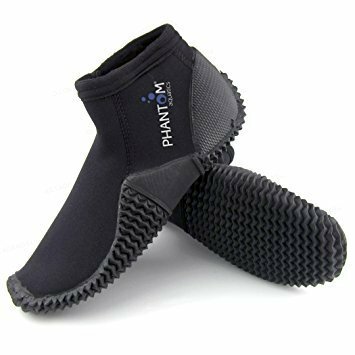 On the other hand, if you will be diving from a boat, it is unlikely that these issues will arise so soft soled boots will provide you with all of the protection that you need. Another point to focus on with these boots is fit and comfort. Since soft boots are more flexible, they offer a much better fit. They are also often more comfortable for those with wide feet. As I have already mentioned, one of the main reasons for wearing dive boots is to insulate your feet against the cold. So, you will need to find one that is thick enough to offer you protection from the temperature of the waters that you are diving in. If you are diving in warm, tropical waters, you will find that a boot that is between 2mm and 5mm thick will be more than enough. In colder waters, though, you may require a boot that is at least 5mm to 7mm thick, perhaps even thicker. If you want a boot that will work well in most temperatures, then it is best to stick with boots with 5mm thickness. This will provide you with adequate insulation in many diving environments. Another good way to determine how thick your boot should be is to look for one with a similar thickness to your diving suit. If you want your dive boots to be comfortable, you need to make sure that you get the right size for yourself. As a rule of thumb, it is best to stick with dive boots that are just a bit snug around your feet. You should avoid shoes that are either too tight or too loose. It is also important to keep in mind that when diving, the pressure will make the boots feel a little tighter around your feet. These days, you will find that the sizes are quoted in both men’s and women’s boots. However, if there are only men’s sizes mentioned, you will need to calculate the women’s size. Usually, women will need to subtract 1 from their current shoe size. So, if you wear a women’s size 7, then you will need to purchase a men’s size 7 dive boot. It should be noted that most dive boots are only available as whole sizes. So, if you currently wear a half size, you will need to round it up. As I have already stated, dive boots have a variety of functions. As such, they are also made up of various materials. This means that the sole, heel, toe, and upper portion of the boot will consist of different materials. These are all held together by stitches and it is why you should always make sure that the stitches are durable. They should be from a high-quality fabric or material and should have double-stitching. It is the only way to ensure that the boot will stay together well, regardless of the conditions that you are diving in. The final point that you will need to pay attention to is the fasteners. Most low cut boots don’t have any fasteners as they can simply be slipped off. Nonetheless, if you will be investing in a high cut boot, it is imperative that you choose one with a zipper. You will find that it is then easier to put on and take off your boots. 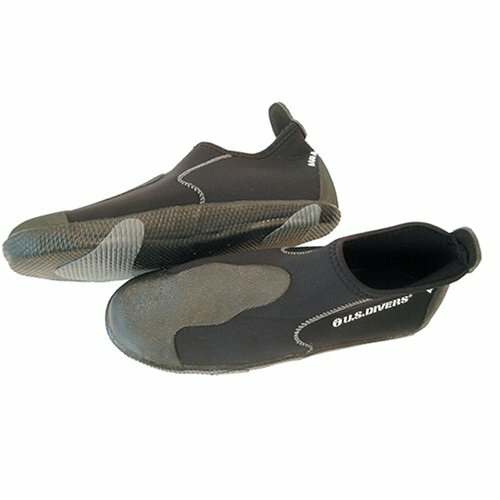 These low cut diving boots are ideal for swimming in warm, tropical waters since they have a thickness of 2mm. They are made from a combination of nylon II neoprene and vulcanized rubber soles. This means that not only are you provided insulation from the water, the bottoms of your feet are also well- protected. You can easily walk on hot sand or pointed rocks without having to worry about injuring yourself. You can also guarantee that the seams on these dive boots will hold together well as they are glued as well as blind stitched. Yet another one of the features I like about these boots is the patterning at the bottom. The high traction sole makes this a good boot for all kinds of surfaces. As a result, you can be quite certain that you will be safe on slippery areas such as boats or smooth rocks. The only real complaint that I have with these boots is the size. They tend to be a bit larger than expected so you may find that you need to order a size smaller than what you usually wear. This is yet another pair of boots that will work well for warmer waters. They have a low cut design and have a thickness of 3mm. The top portion of the boot is made up of nylon II neoprene while the lower sole consists of rubber. The seams on these boots have been sewn incredibly well so you can be certain that these are a rather durable pair of shoes. The boots are also very easy to slip on and slip off so even new divers will be able to manage with them really well. Another aspect of this boot that is very helpful is the grip on the sole of the shoe. All the patterning ensures that you are provided with an excellent grip. So, you will find that you can walk fairly well on many different kinds of surfaces, without a problem. There are a variety of different sizes with these boots so you should have no trouble finding a pair that fits you. The only thing that I found disappointing about these dive boots were the thickness of the soles. While they should provide you with enough protection from hot sand, you may need something a little thicker or tougher when walking on sharp rocks. These are certainly a versatile pair of boots. With a high cut design and a thickness of 5mm, you will find that these boots are suitable for most diving conditions. There is also a 7mm version if you want to go diving in slightly colder waters. What I like most about these boots is that they are very accommodating of open heel fins. There is a built-in fin strap holder that helps to keep your fins in place while diving. I also appreciate that these are a durable pair of shoes – the upper portion is made of nylon II neoprene while the sole is made of tough, ribbed rubber. The seams are also held together very well, guaranteeing a long lasting boot. The neoprene is actually rather flexible which offers you greater comfort, especially if you have a slightly wider foot. The ribbed sole allows you to maintain a good grip on a variety of surfaces, regardless of how slippery they are. The sole is also thick enough to keep you protected from sand and small stones. The minor complaint that I have regarding these boots is the zipper. For people with smaller ankles and feet, they have a tendency to unzip under water. These high cut shoes have varying thicknesses – from 3mm to 7mm. Due to this, you are sure to find one that suits the kind of waters that you will be diving in. There is also no denying that these boots have been designed and constructed really well. They are made up of a combination on a neoprene upper and a synthetic sole. On top of this, the seams haven’t just been sewn, they have also been glued together. This makes them incredibly durable and excellent at keeping water at bay. Speaking of durability, the bottom of these soles are made from puncture-proof material. You will find that walking on sharp rocks will be an absolute breeze with these boots on. They also have a really good grip. The zipper on these dive shoes functions well. So, you will have no trouble pulling them on or off when needed. The zippers also have a water entry barrier behind them to further ensure that no water will be leaking in. The thing to watch out for with these boots are the ankle sizes. Here, the boots tend to be a bit big, which means that when you dive, the water can come in through the gaps there. With these diving boots, you get the best of both worlds. 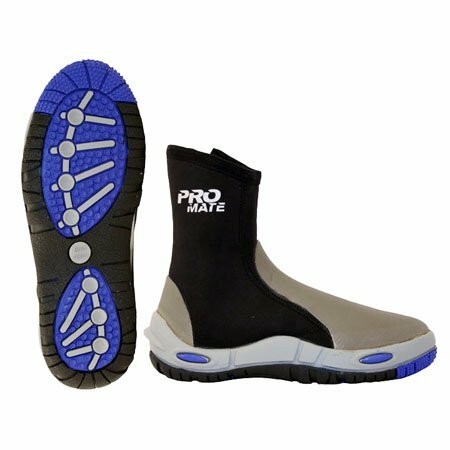 Now, the low cut design and the 3mm thickness on the upper neoprene portion of the shoe makes this boot excellent for warmer waters. However, the vulcanized rubber sole is actually closer to 5mm thick. So, although you get to enjoy a lighter boot, you also get to ensure that the soles of your feet are properly protected. Taking the soles to the next level is the fact that they are puncture-resistant, perfect for all sharp or uneven surfaces. The other notable thing about these diving boots is that despite the low profile, the grip on the sole is actually quite good. What I really like about these boots, though, is the fact that they are equipped with a water purging feature at the heel. Since it is nearly inevitable that water will get into your boot at one point or another, this feature allows you to get rid of it quickly and easily. Now, these boots are available in a number of sizes, although they are only mentioned as men’s sizes. The thing to watch out for here is the fit. This is because these diving boots tend to run a bit small so you may want to order a size slightly larger than what you usually wear. These high cut boots are good for both warm and cool waters as they have just the right thickness at 5mm. The upper portion, made up of neoprene works beautifully to keep your feet nice and warm in all conditions. 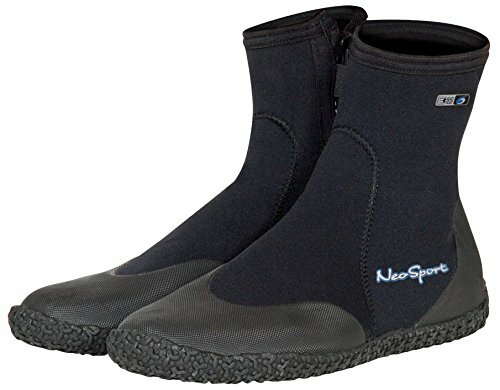 The lower portion of the dive boots is made from sturdy, durable rubber. This makes it an excellent option for walking or rough or jagged surfaces without worrying about injuring yourself. The zippers on these dive boots are durable and work well to easily put on and remove the boots as needed. One of the great things about these dive boots is that there are plenty of size options available. This makes it a lot easier to find one that fits. For the most part, these boots function well in all conditions. The only real problem that I could find was the grip. It isn’t all that great at keeping you balanced and stable on slippery surfaces. Also, although it doesn’t affect function in any way, the dive boots have a shoddy look since there is glue all over the seams. Apart from these problems, though, these dive boots are a good investment. If I had to pick a winner from the dive boots mentioned here, I would have to say that there isn’t a clear option. This is because you need to choose one that is right for your specific circumstances. So, if you want a warm water option, the Mares Equator dive boots would work well for you. They are lightweight, have been constructed well, have a protective sole, and are durable. 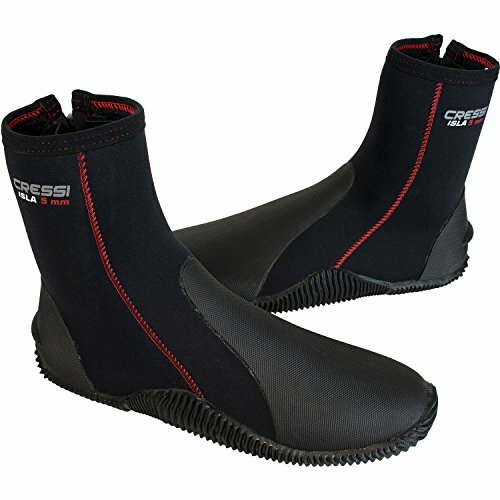 For something that will work in slightly cooler waters, I would recommend the Cressi ISLA. It has a high cut design, a sole that boasts both grip and protection, and is excellent to wear with open-heeled fins. This brings this article and guide to a close. Nonetheless, with all of the information provided here, you are sure to have no problem finding the perfect pair of dive boots for yourself. Of course, you will need to remember all of the tips and guidelines mentioned here.